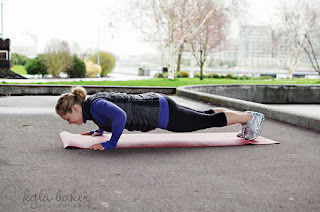 Fit 4 Two: Are pushups safe for women with Diastasis Recti? Are pushups safe for women with Diastasis Recti? If you are a certified PPFS, you know that when a woman has Diastasis Recti (DR) we should advise her to avoid exercises that engage the rectus abdominal muscles. Obvious no-nos include crunches, curls and sit ups. But what about the less obvious agitators? The front plank, regardless of whether you do it on your toes or knees, most definitely fires the rectus abdominal muscles. A pushup is a front plank with movement. In other words it is a really hard front plank that also works the chest, shoulders and triceps. This one is super sneaky. Go try it. See? When you press your fists down to your hips your rectus abdominal muscles turn on significantly. Do you have any to add to our list?